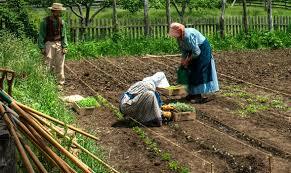 What is an Organic Gardening? - Begin Prepping Now!! It’s time to start planning gardens, people. I am so happy. I love looking at seed catalogs and planning for the summer. If you have not put a garden in before I highly recommend you think about doing some veggies. Gardens are a great source of quality nutrition. It is also a source of pride and independence. Gardens are a great way to reconnect with our heritage and our communities. I know many people think of the picture above when I say garden, but there are so many kinds of gardening…you can find or create one that fits your situation perfectly. You don’t have to be a green thumb to plant some veggies. I do have some ideas that will make gardening less intimidating for the novice planters. Plant veggies you like. If you hate radishes- don’t plant them. If you love lettuce and onions and beans and nothing else. Plant three things in your garden. Don’t ‘should’ in your garden. Don’t look to Martha Stewart for you idea of a garden. Be realistic. 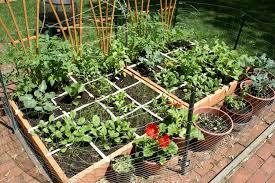 If you have 10 minutes a day to devote to garden care, don’t till up half of your grass to plant veggies. Read ‘The Square Foot Garden Book’. This book is the dummy book for gardening. It gives you a dirt recipe that could grow groceries on concrete. It also explains how to maximize space and yield, while eliminating rototilling all together. Learn how to grow in your area. Some areas require cold boxes, others irrigation, or fans. Learn what will grow in your area. It doesn’t matter how much I like okra, it is wasting space in my garden because we will never have enough warm days for them to produce in my yard, so I don’t waste the space. Maximize your space. I have a small garden space, so I choose to avoid single product produce. It takes the same amount of space to plant a tomato or a broccoli. A tomato is going to produce 4-5 times through the summer. A broccoli will produce 1 head of broccoli all summer long. So I avoid broccoli and just buy it. Buy organic heirloom seeds. They are more expensive, but they will make seeds for next year if you have to save them. If you can’t afford a ton of seeds buy some cheap seeds to plant this year. Then in mid summer, when seeds are being clearanced, buy good seeds for next year. Then save your own seeds next year. Learn how to save seeds properly. If you learn to gather and dry seeds from organic heirloom plants, you don’t have to buy seed ever again. All plants will produce seeds, but plants that have been genetically altered frequently produce dead seeds. They will not germinate. Some GMO plants will grow but they produce little to no veggies. A great example is a potato. Most potatoes are GMOs. And they will sprout and grow a beautiful plant. Last year my kids wanted to plant the potatoes that sprouted from the store. So we did. They grew into gorgeous plants. I trimmed them, like I would any other. And when we dug them up, we got less than two pounds of potatoes from each plant. If those had been organic seed potatoes, they would have produced between 20 and 40 pounds of potatoes. You don’t need a big garden to have veggies. 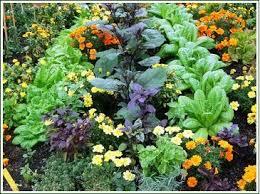 Vegetable plants can be planted among your flowers to be hidden in plain site. 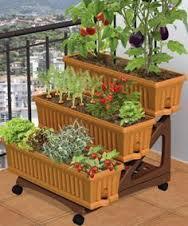 A patio can have a tomato plant in a pot and some salad greens in another. The garden on the left uses veggies as the greenery backdrop in their flowerbed. 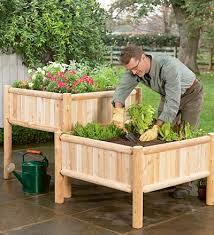 This is a great way to use an existing flower bed to get a salad garden started. 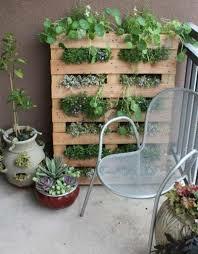 Consider container gardening if you have limited time or space. There are some considerations with pots. They require more water, but there is virtually no weeding. 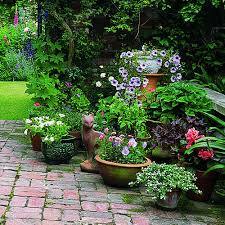 Below I have put pictures of some very different container gardens that run the gamut of style and price. I know that some of this will take a bit of time, but it is time well invested…and you will only have to do it once if you keep all the info for next year to review. Gardening veggies does not have to be intimidating. Start small to test drive it if you want. Just do something. It is a small step towards your healthier happier family. Love your post, I have an Aquaponics garden and grow organic vegetables. The difference in the taste is incredible when your veggies are organically grown and picked fresh. With my Aquaponics system, the plants are fertilised naturally through the waste from the fish. No chemicals are used at all. With Aquaponics being so efficient it is possible to grow up to 10 time more plants in the same size garden as conventional gardening methods. 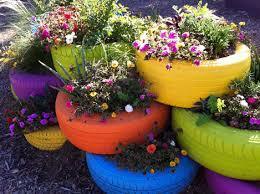 They quicker, larger and healthier than other gardening methods. Thanks, I really enjoyed reading your post. I do love fresh garden veggies. Aquaponics is very interesting to me. I love the idea of having a whole ecosystem,meat and veggies growing in the garage. So cool! Mainly this is because I was born in a farm cottage and raised on the farm. I also got married and raised my own family on the land until I was in my late 30’s. This meant that like so many of the country folk our family had a big garden and as we were a big family (9) a veggie garden was a must have. We also had all sorts of berry bushes and fruit trees. The connection to your article is that of course all our produce was organically grown. It always tasted fantastic with all the natural goodness. This your DO NOT get in today’s supermarkets. I love fresh veggies…there is nothing like vine ripened food. It has a better taste and more nutrition than most of what we buy. I am glad you enjoyed the article. This article drew my attention because of my background. I was actually born in a farm cottage and spent all my childhood on the land. Of course being country folk we had a big garden and all the produce of those gardens was 100% organic. Then when I got married I also had a big garden full of every kind of veggie you could imagine. I can honestly say I could grow anything and being organic you had 100% freshness and the taste.. well you would never get that particular taste from the veggies in supermarkets. A very good article Enid and it took me back quite a few years to the good old days when what you put in your mouth you knew where it came from when it was home grown. Homegrown veggies ripened in the sun is a taste experience. I am glad it brought back good memories. I hope you keep reading and find lots of articles that make you smile.